This summer, after more than two centuries of building unmistakable bonds with beer lovers in the U.S., Guinness will finally have a permanent home in America. Diageo Beer Company USA is proud to announce that the Open Gate Brewery & Barrel House, located just south of Baltimore, will open to the public on Friday, August 3rd. While Guinness Draught and the other classic stouts will be brewed exclusively in Ireland and imported to the U.S. to be enjoyed responsibly, this brewery is an important step in the evolution of the brand. Led by Brewmaster Peter Wiens and Head Brewer Hollie Stephenson, the Maryland team will take over the production of Guinness Blonde and experiment with new beers influenced by both American and Maryland brewing tradition. 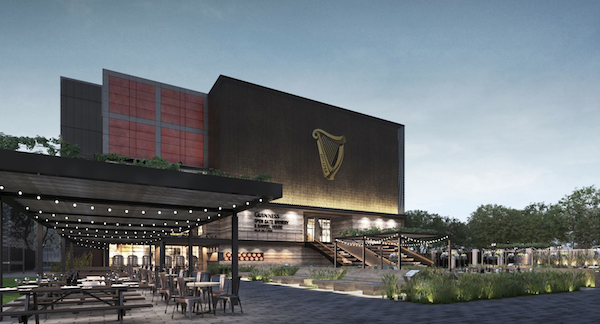 Visitors to the Open Gate Brewery & Barrel House can expect a world-class Guinness experience, blending local Maryland flavor and Irish hospitality, from the staff to the beers to the décor of the buildings and the food in the brewery’s restaurant. The taproom, tours of the 10-barrel brewery, the merchandise shops and the grounds will be open on August 3rd, with the restaurant opening approximately two weeks later. In the meantime hungry visitors will be able to order bar food in the taproom, and there will often be some of Maryland’s finest food trucks on site. To stay up to date on the Open Gate Brewery & Barrel House in advance of its debut and beyond, check out @GuinnessBreweryUS on Facebook and Instagram. Whether enjoying a pint in Maryland, Ireland or anywhere around the world, always do so responsibly. Print article This entry was posted by Art Eddy III on July 3, 2018 at 8:10 am, and is filed under Lifestyle. Follow any responses to this post through RSS 2.0. Both comments and pings are currently closed.